After strengthening cooperation with the Kingdom of the Netherlands, the delegation of the Republic of Tatarstan under the leadership of the President of the Republic Rustam Minnikhanov arrived in Copenhagen (the Kingdom of Denmark) to expand the spheres of cooperation with other European states. The meeting with the senior officials of the Danish Agriculture and Food Council took place in the Confederation of Danish Industry. The delegation of the Council is expected to pay a reciprocal visit to Tatarstan this summer. The meeting with the Deputy Minister of Foreign Affairs of Denmark's foreign trade Suzanne Hyuldelund and negotiations with the President of "Danfoss" Heating Group Lars Tveen. 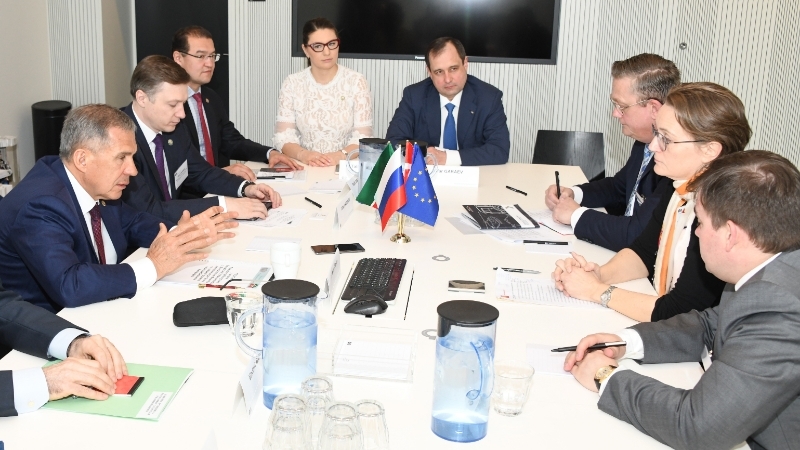 The key event of the visit was "Denmark-Tatarstan" round table, with the participation of top officials of the countries and regions, as well as top managers of Denmark. "I want to express my gratitude for the organization of our visit, for the opportunity to learn more about the opportunities for mutually beneficial expansion of our ties. We are interested in attracting Danish business and capital to the Republic of Tatarstan and are ready to provide all possible assistance. During the negotiations we expect business circles to open new areas for cooperation and agree on joint projects", - the President of the Republic of Tatarstan noted in his speech. Director for market development of the Confederation of Danish Industries Jens Nielsen, Ambassador extraordinary and Plenipotentiary of Russia to Denmark Vladimir Barbin, Deputy Minister of Foreign Affairs of Denmark's foreign trade Suzanne Hyuldelund made a welcoming speech. The round table was also attended by the President of "Haldor Topsoe" company Bjerne Clausen, President of "ROCKWOOL" company Jens Birgersson and others. The event marked the expansion of cooperation with leading Danish companies, including the world leader in catalysis and the study of physical and chemical properties of the surface. "Haldor Topsoe" company allows chemical and oil and gas companies to receive best value for technological processes and implements production at the lowest costs of energy and resources. The Agreement on the development of cooperation between Tatarstan Government and "Haldor Topsoe" company, the Agreement on cooperation between the Kazan National Research Technological University and "Haldor Topsoe" company and the Memorandum of intent between PJSC "Nizhnekamskneftekhim" and "Haldor Topsoe" were signed in the frames of the round table. Participation in new industrial projects implemented on the territory of Tatarstan, development of joint scientific and research and educational activities, as well as further optimization of facilities operating in the republic and based on the technologies of "Haldor Topsoe" company trough the expansion of the program of technical maintenance and personnel training are among the prospects of cooperation. In addition, the intention on establishment of the "Danfoss" Competence Centre in the Kazan State Power Engineering University was signed by the both sides. "Danfoss" is an international concern for the production of thermal automation, refrigeration, drive technology and industrial automation. "Relations between Tatarstan and Denmark are developing successfully. A striking example of effective cooperation between countries and regions is the localization of production on the territory of our Republic. Thus, in 2012 "Rockwool" company launched in Tatarstan one of the largest plants in Europe for the production of non-flammable materials. Enterprises and universities have been cooperating with "Haldor Topsoe" company, and today we have brought this interaction to a new level. Of course, we are very pleased that "Danfoss" company sees Tatarstan as a key Russian partner. We can safely say that the visit to Denmark was fruitful. Presenting trade, economic and investment potential of Tatarstan during the round table, together with the representatives of governmental and business circles of Denmark, we have identified new areas of cooperation, thereby strengthening the Tatarstani-Danish union", - the Head of Tatarstan Investment Development Agency Taliya Minullina concluded.